Whether you’re looking for bleach to clean the sheets at your hotel or you need bulk laundry detergent for cleaning the linens at your restaurant, our commercial laundry detergent is the perfect option. We carry many different types of detergent, so it’s easy to find the right option for your business. As an added bonus, our detergent and soaps come in bulk cases, which are ideal for commercial businesses that need to do several loads of laundry a day. For more cleaning and laundry products, check out our laundry carts, chemical pumps, and scrubbers and sponges. 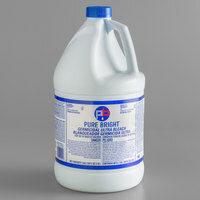 If you're wondering where to buy pure bright commercial laundry detergent and supplies, we have a large selection of pure bright commercial laundry detergent and supplies for sale at the lowest prices.